We like the swivel (“S”) version of the Harris bipod. The swivel (actually tilting) capability of the bipod allows you to tilt (cant) your rifle around the bore axis to level the rifle on a side slope or uneven ground. Unfortunately, the swivel tensioner (friction knob) that comes standard with a Harris swivel bipod leaves much to be desired. The tensioning knob is hard to adjust with your fingers. The small knurled ring doesn’t offer enough leverage. When it’s tight enough to prevent movement it’s hard to release. For this reason, many folks replace the standard knurled ring with a rotating adjustment lever with push-button release. This works great and is easy to install. 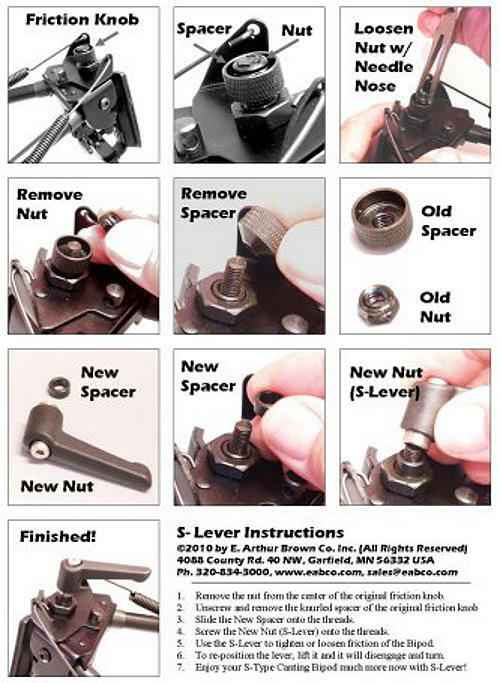 While you can buy levers from various sources, Eabco.com has a tried-and-true system that works with both Harris and Caldwell XLA-S swivel bipods: “Our new S-Lever Tension Lever is an economical replacement for the friction tensioning knob to give you much better control and leverage.” For just $12.95, Eabco.com delivers all the parts you need for the upgrade. Shown below are instructions for installing the Eabco S-Lever. Share the post "Handy Adjustment Lever Kits for Harris Swivel Bipods"
This is a handy and worthwhile improvement. Harris should incorporate this themselves. How is this not a direct copy of the KMW PodLock, which has been around for well over ten years?